Oftentimes, you'll download a file only to discover that you can't play it since you don't have the right codec installed. Codecs decode the information in a video so that you can view it on your monitor. 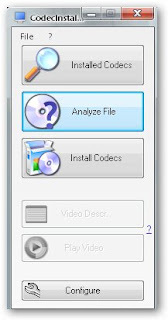 CodecInstaller is a simple program that tells you what codecs to install to play a video file. It analyzes a video to figure out what codecs you are missing and tells you where to go to install them.